Google employees are now quitting in protest of the company's contract to develop a controversial drone program for the Pentagon. Last month, The Free Thought Project reported that thousands of Google employees were speaking out about the company’s close relationship with the Pentagon, and their involvement in the business of war. Some of the employees who are resigning in protest have spoken with Gizmodo anonymously about their decisions. “At some point, I realized I could not in good faith recommend anyone join Google, knowing what I knew. 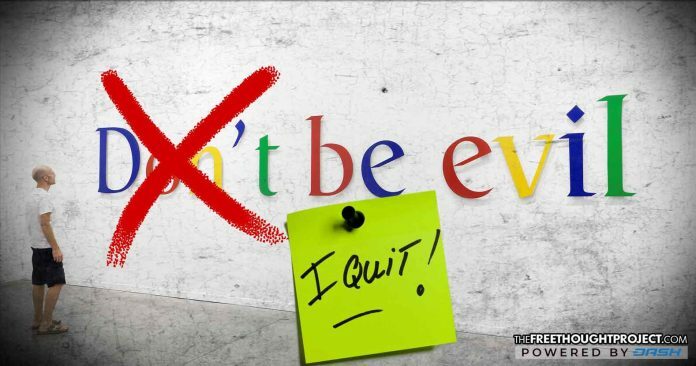 I realized if I can’t recommend people join here, then why am I still here?” one resigning Google employee told Gizmodo. “I tried to remind myself right that Google’s decisions are not my decisions. I’m not personally responsible for everything they do. But I do feel responsibility when I see something that I should escalate it,” another said. “Actions speak louder than words, and that’s a standard I hold myself to as well. I wasn’t happy just voicing my concerns internally. The strongest possible statement I could take against this was to leave,” one resigning employee added. While employees have attempted to influence Google’s political policies in the past, this is the first time that there was ever a mass resignation over a specific issue. In 2015, a large number of Google employees and users successfully protested Google’s ban on sexually explicit content. One resigning employee wondered why Google is willing to risk their reputation to be involved in such controversial projects. “It’s not like Google is this little machine-learning startup that’s trying to find clients in different industries. It just seems like it makes sense for Google and Google’s reputation to stay out of that,” the anonymous employee said. However, these high-dollar Pentagon contracts seem to be an issue that the company is not willing to budge on. Despite the fact that hundreds of AI experts have also called on Google to stop the program for ethical reasons, the company is showing no signs of backing off. “We are also deeply concerned about the possible integration of Google’s data on people’s everyday lives with military surveillance data, and its combined application to targeted killing. Google has moved into military work without subjecting itself to public debate or deliberation, either domestically or internationally. While Google regularly decides the future of technology without democratic public engagement, its entry into military technologies casts the problems of private control of information infrastructure into high relief. Google has reached a point where they feel that they are untouchable, and they have also reached a point where their government clients are likely far more important to them than their clients in the private sector. In the past, Google may have been focused on innovation and connecting people through technology, but it is obvious that their focus has now shifted towards military and surveillance applications. While a dozen or so employees will not make much of a difference to Google’s bottom line, they are setting an important precedent by refusing to work on military projects, and hopefully, others will follow in their footsteps.